Costa Rica is famous the world over for it is amazing and diverse wildlife. To this day I don’t think we have been to such a small country that has that many animals. It is quite easy to forget that Costa Rica has two coastlines; The Caribbean Coast and The Pacific Coast. With that in mind here are some Spectacular Costa Rica Beaches you Must Visit when you come to this green and pleasant land. Don’t worry about not spotting animals either as some of these beaches are also national parks that are teaming with wildlife. So lay back and enjoy the best beaches in Costa Rica. When you think of the Caribbean sea and beaches you picture white sand beaches and crystal clear waters. Unfortunately, Costa Rica doesn’t quite have that, as many of its rivers run into the Caribbean Sea. However, that shouldn’t put you off visiting as there are some lovely beaches on Costa Rica’s Caribbean coast. Our two favourites were Playa Tortuguero and Playa Blanca in Cahuita for very different reasons. Here is what we think about best beaches on Costa Rica’s Caribbean side. Have a rum punch and chill out. 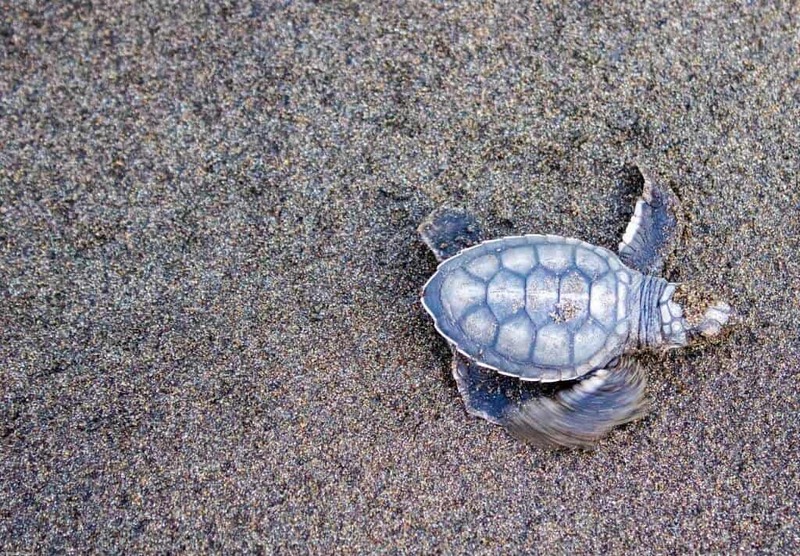 Playa Tortuguero is one of the best beaches in the world to see turtles. You won’t be swimming here but you won’t mind as the star attraction on this beach is the Green Turtle. We were lucky enough to witness a few mothers laying eggs one night and the following morning watched little turtles make their frightful first steps to the Caribbean Sea. It was truly a magical experience. We loved the tiny town of Cahuita. What it lacked in size it made up with great restaurants, bars and interesting locals. Playa Blanca sits right in the National Park and has beautiful swimming beaches with crystal clear waters. The further you walk into the park the better chance you have to find your own secluded beach spot. Oh and since it is a National Park there is a high chance you will spot monkeys and countless birds while you lie back on your towel. We thought this was the best swimming beach on Costa Rica’s Caribbean side. Most people bypass Puerto Limón to head to Tortuguero or the beaches in Cahuita and Puerto Viejo. 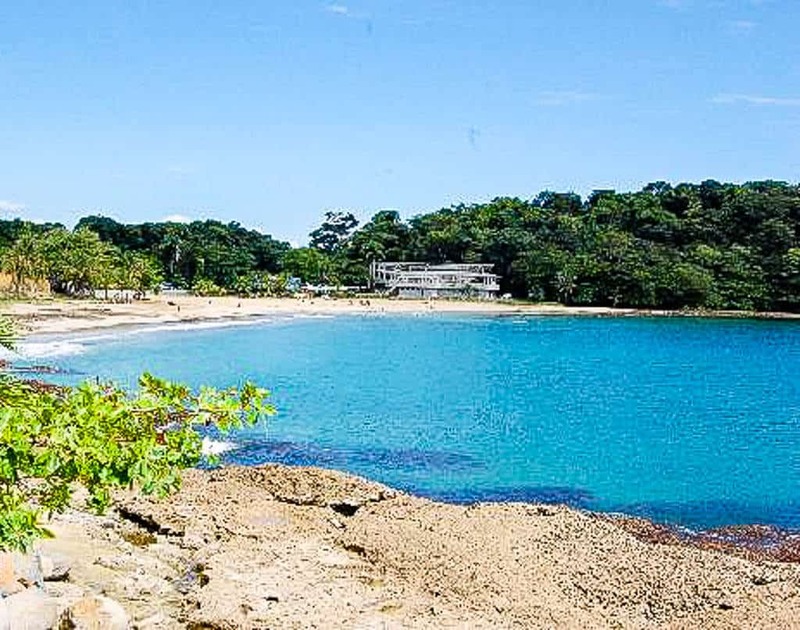 However, if you are in Puerto Limón , Playa Bonita is a good beach to head to as it is one of the only sandy beaches in the area. This is a popular beach for locals to surf and play football on so if you want a snapshot of local life this beach is for you. 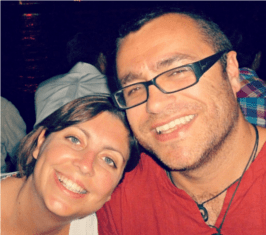 If white sand beaches aren’t your thing (what’s wrong with you!) then Playa Negra (Black Sand Beach) is your beach. This black sand beach is often empty so if you want that Robinson Crusoe feeling on a Costa Rica Caribbean beach then Playa Negra is your ideal spot. 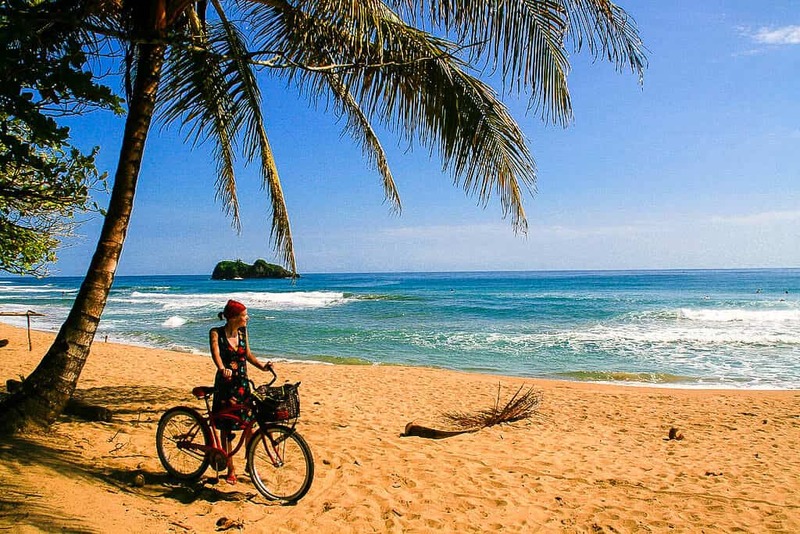 Puerto Viejo is the most popular spot on Costa Rica’s Caribbean coast. It’s not hard to see why. There are tonnes of bars, restaurants and shops but it still has that laid back Caribbean vibe. Playa Cocles is very popular with surfers, but you can also swim here as it’s one of the few beaches in the area that is patrolled by lifeguards. There are loads of food vendors nearby if you get hungry. 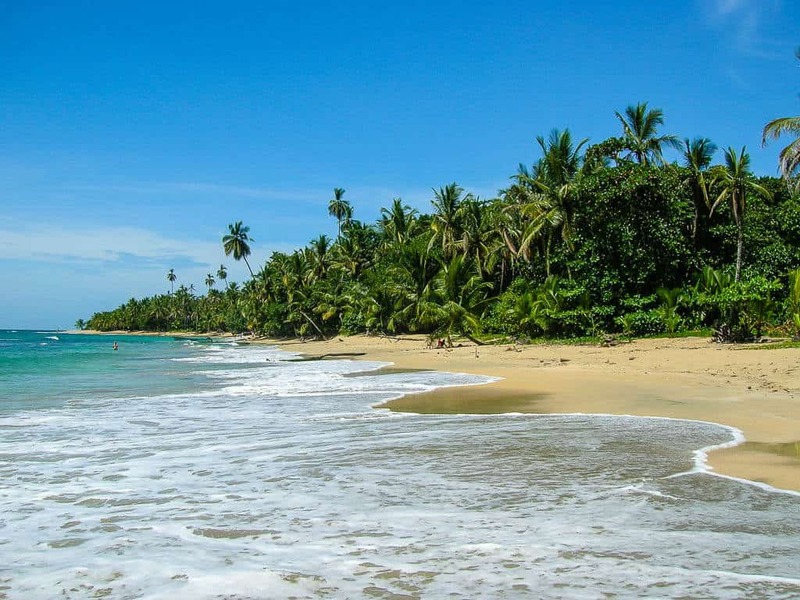 Punta Uva, sandwiched between Puerto Viejo and Manzanillo is one of the most popular beaches on the Caribbean side of Costa Rica. 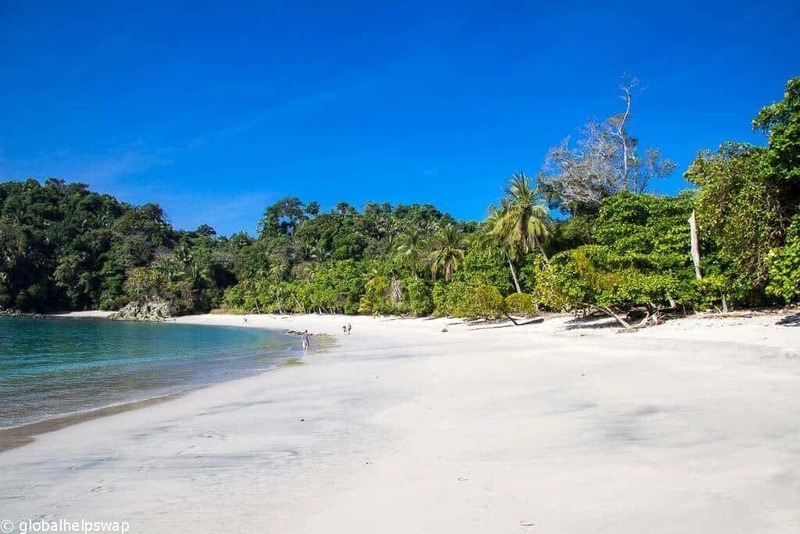 With calm protected reef waters and a white sand beach this is a great place for families and people who want a quieter beach in the Puerto Viejo area. Just eight miles south of Puerto Viejo, Manzanillo feels like a world away. This small village of 300 people has an ultra laid back feel. Playa Manzanillo is two miles long with a coral reef just off shore. 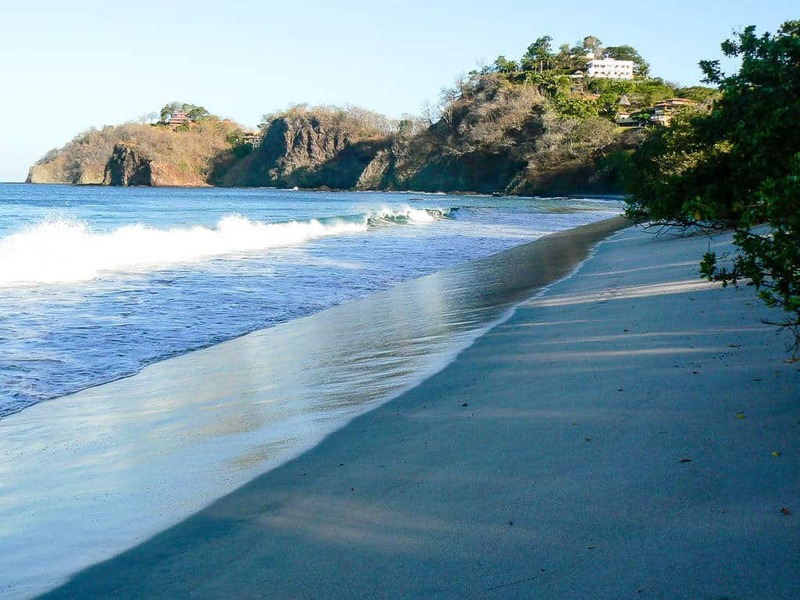 Some of the most beautiful beaches in Costa Rica are found on its Pacific Coast. 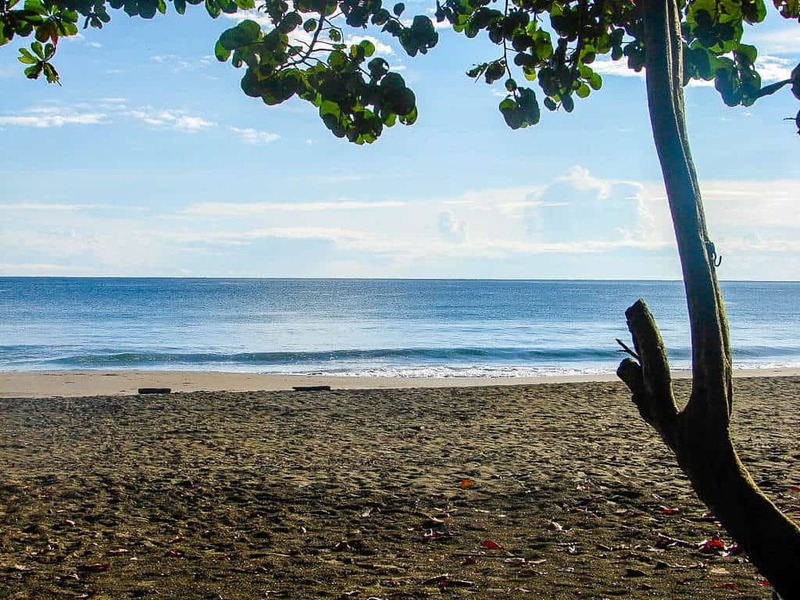 As Costa Rica’s Pacific Coastline is 500 miles longer than the Caribbean side it’s not surprising to find some of the top beaches in Costa Rica here. 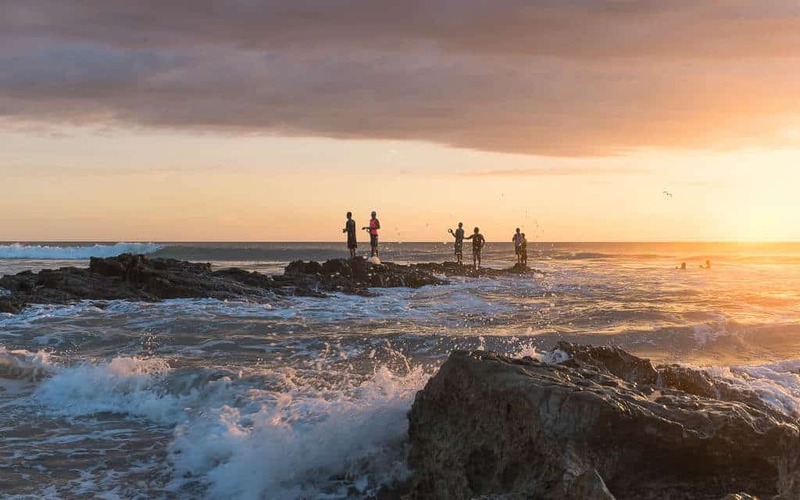 From secluded beaches to popular beaches, Costa Rica’s Pacific side has it all. 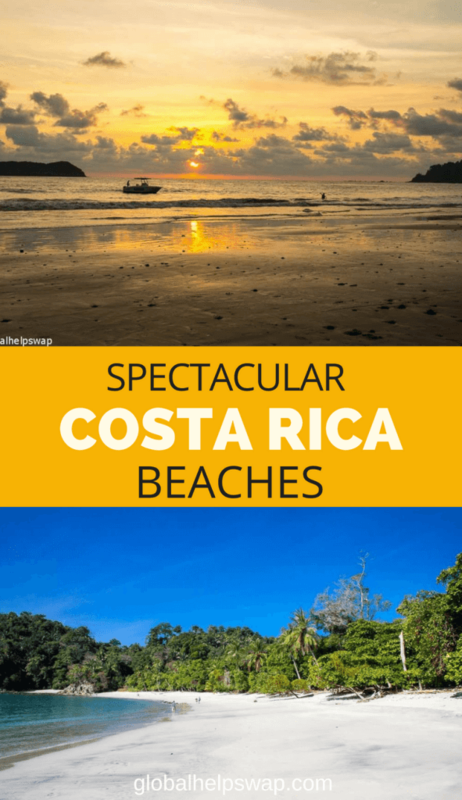 Which is the best side for beaches in Costa Rica? Hmmm, visit both sides and you decide. We loved this beach for so many reasons. 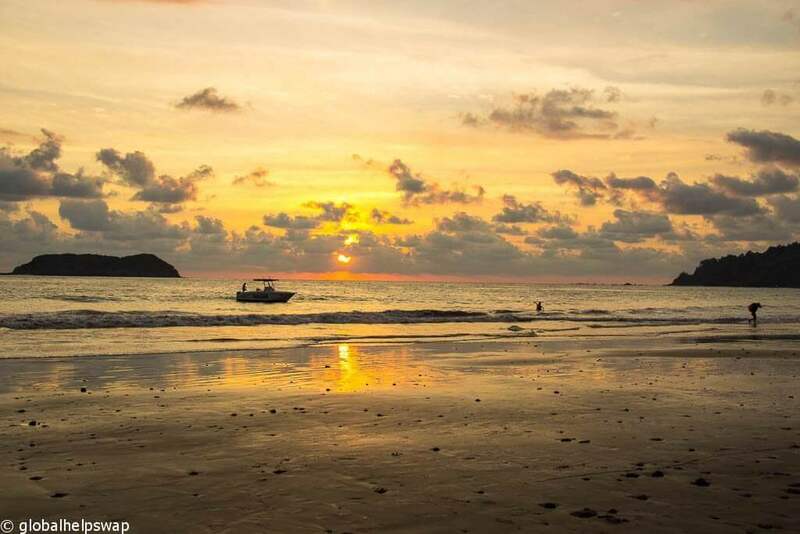 From meeting the locals to the ultra calm waters, Manuel Antonio was a beach like no other. As it is in the National Park of the same name, this is a protected area. Make sure you get there early to enjoy the beach for yourselves before the many tourists arrive. 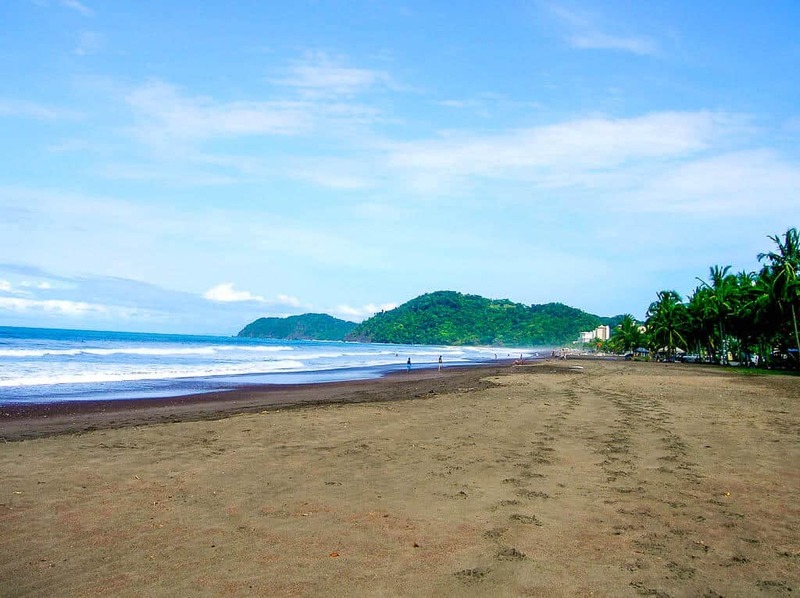 Santa Teresa has some of the most popular Pacific Coast beaches in Costa Rica. (Gisele Bündchen has a villa there). Located near the dramatic southern tip of the Nicoya Peninsula, Santa Teresa has a similar feel to Tulum in Mexico. 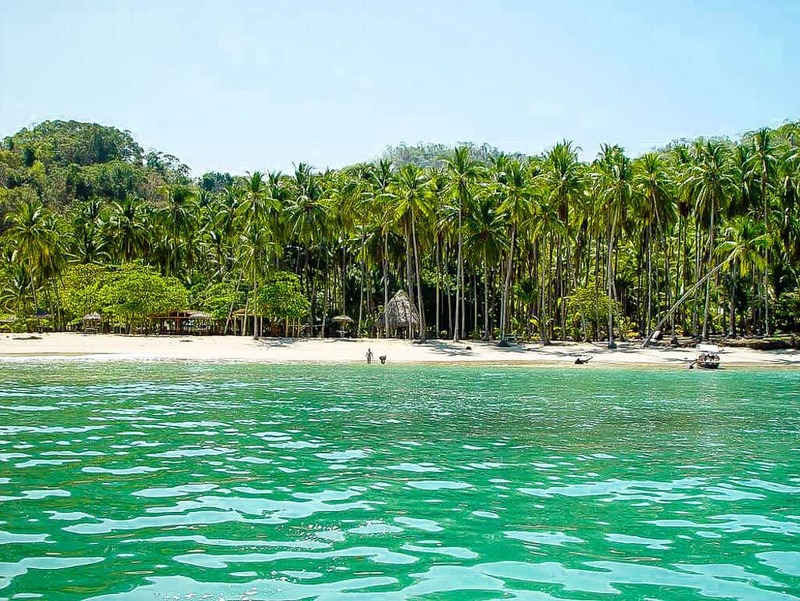 Here you will find beautiful white sand beaches, yoga studios and just 5 miles to the south the pristine 3,000-acre Cabo Blanco nature reserve. As Santa Teresa is not easy to get to, most daytrippers avoid the place leaving this stretch of paradise to the intrepid traveller (for now). 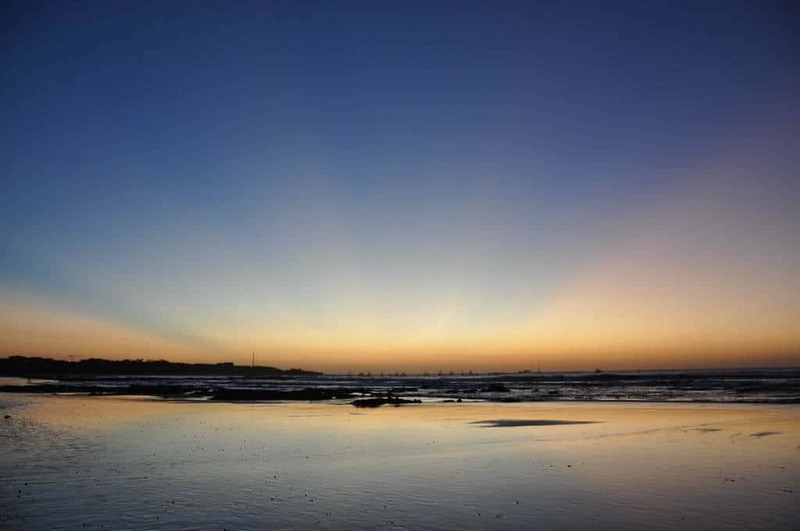 Tamarindo beach is the opposite of the beaches in Santa Teresa. Here you will find an action packed scene with a lively nightlife. That doesn’t stop it from being from one of the most popular tourist beaches in Costa Rica. 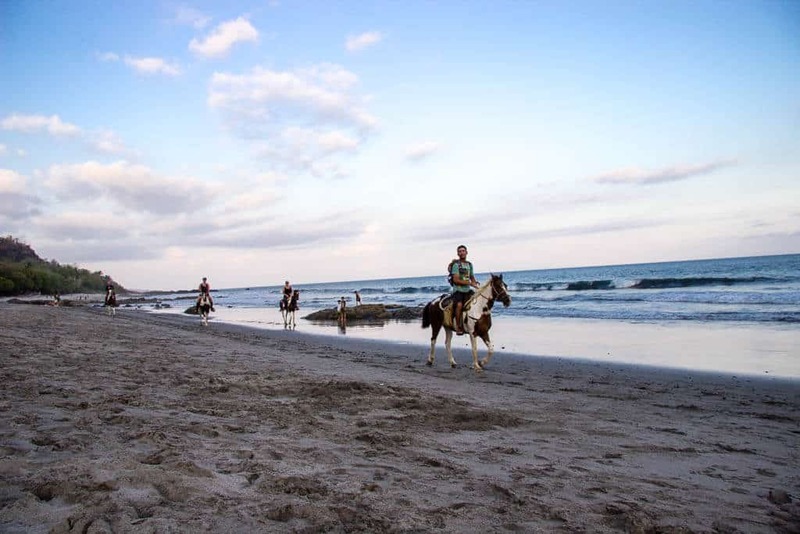 Tamarindo is also one of the best surfing beaches as it is great for beginner surfers. If a party beach is what you are looking for then Tamarindo beach is the one for you. 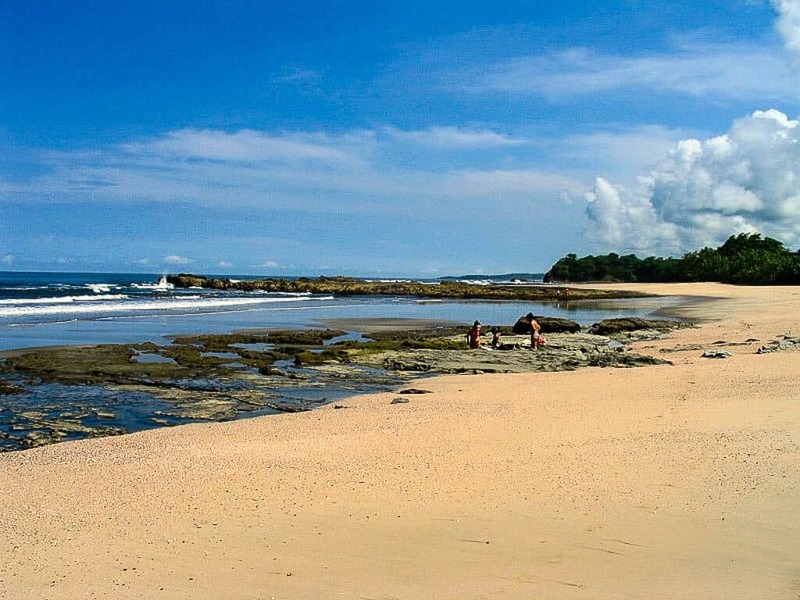 Playa Guiones and Playa Pelada are two beautiful light sand beaches 3 miles from Noara. 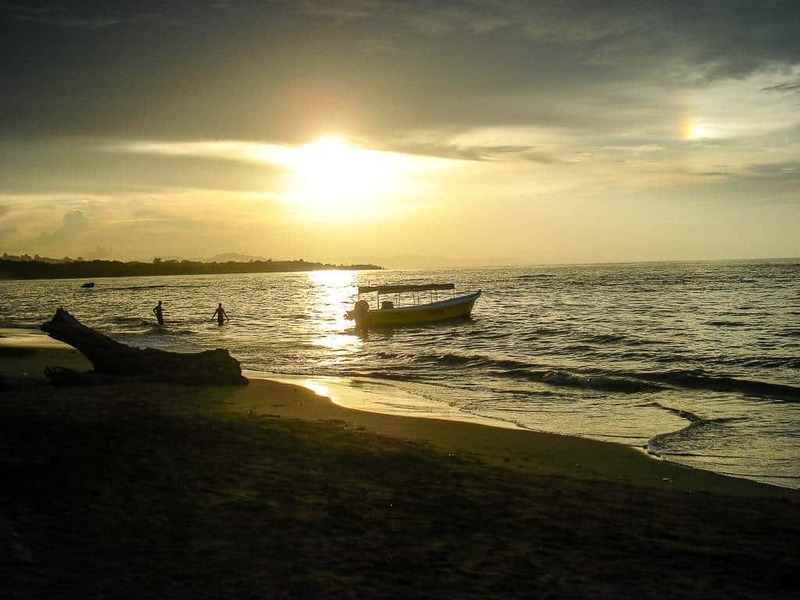 Playa Pelada is considered by many to be one of the best and most beautiful beaches in the Guanacaste region. Playa Guiones is a gorgeous, seven kilometer stretch of white sand. Home to many of Nosara’s hotels, restaurants, and businesses, this beach is busier than Playa Pelada. Both beaches are popular with surfers and yoga lovers. 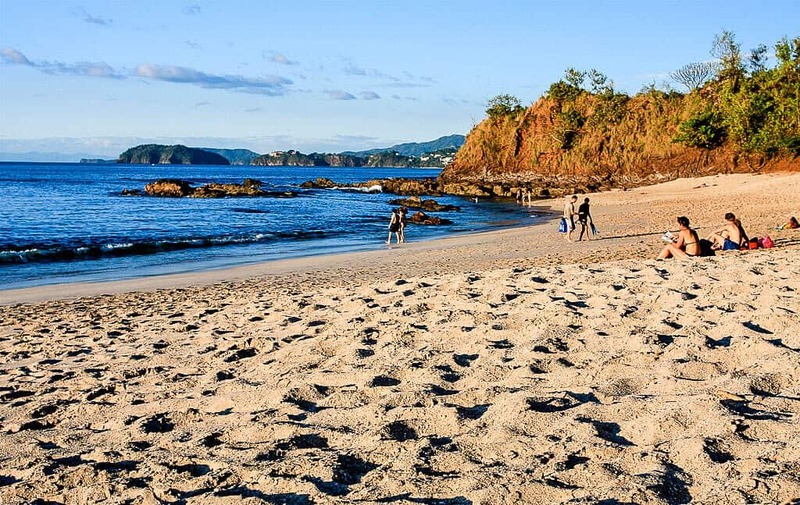 Playa Conchal is one of the best beaches in Costa Rica for swimming. With a beautiful turquoise bay and white sand this is also one of the prettiest beaches in Costa Rica. So far it is off the radar of most tourists and developers making it feel almost like a hidden beach. So shhhh. Playa Flamingo is a great beach to watch sunsets. As it is facing west, most nights are blessed with spectacular colours. This beach is popular with families and more high-end tourists so if you are more the hostel type then it’s probably not for you. We loved the vibe of this beach town. It has this bohemian feel that is infectious. Montezuma is located on the very southern coast of the Nicoya Peninsula. It attracts more intrepid types that your typical holidaymakers. The highlights were the wildlife, the beaches (obviously) the forest and the towns great restaurants. Playa Montezuma is a lovely stretch of sand that attracts people all day long. The waters are a little choppy so take care. People congregate here at dusk to watch the spectacular sunsets. For a lovely alternative walk along the jungle trail (about 45 mins) to Playa Grande, a huge white sand beach that had calm waters when we visited. This is one of the closest beaches to San Jose. It is one of the most developed beaches in Costa Rica with hotels, souvenir shops and restaurants all facing the beach. The town has developed a reputation over the years for its party atmosphere but the town is doing it’s best to attract more families as of late. It’s a popular weekend spot for people living in San Jose. Just off the Nicoya peninsula are Isla Tortugas (or Turtles Islands). These uninhabited islands are home to some of the best beaches to visit in Costa Rica. If the perfect image of a beach is white sand beaches, palm trees and crystal clear waters then Islas Tortugas are the islands for you. You can get a boat to Isla Tortugas from Montezuma. So these are some of the top beaches in Costa Rica. We are sure we have left many out so if you know of some other beautiful beaches in Costa Rica please let us know. Also check out what Lonely Planet has to say on this beautiful country. 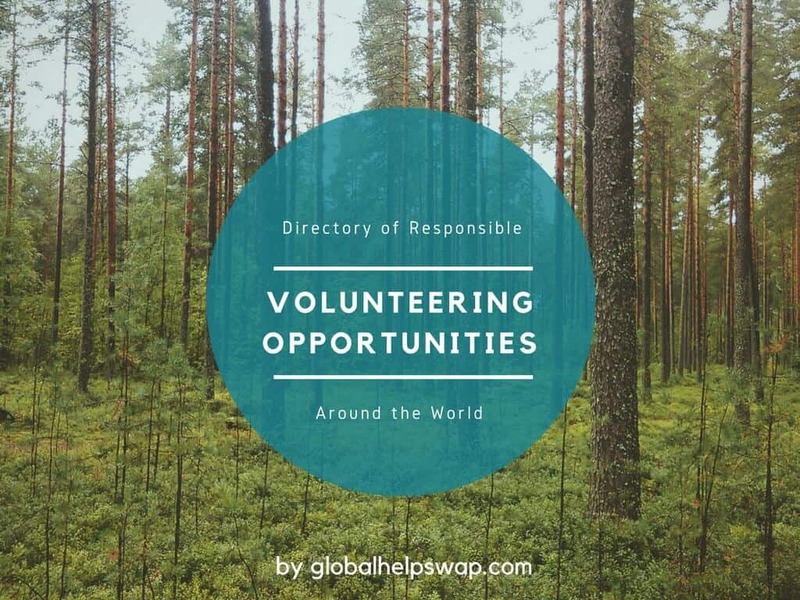 World Environment Day & World Oceans Day 2018 | Celebrating Planet Earth – Happy World Environment Day! We look back at some of the amazing experiences we have had with wildlife and nature on our travels. Thanks for the comment. We are glad that you liked it.